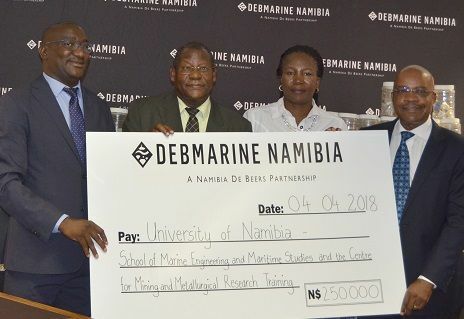 Offshore diamond miner, Debmarine Namibia, this week made a substantial contribution to the School of Marine Engineering and Maritime Studies, and to the Centre for Mining and Metallurgical Research and Training, that resort under the University of Namibia. 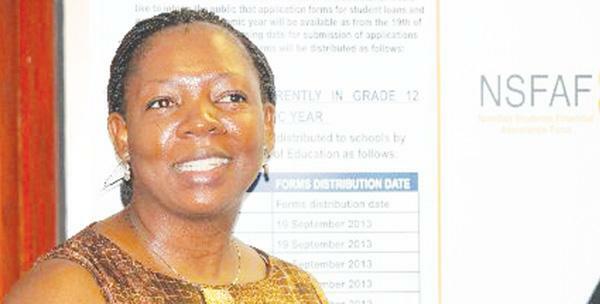 According to Shikongo, Namibia currently does not have an institution that provides dedicated education and training in maritime fields at bachelor or postgraduate degree level. “Aspiring Namibian youth that are interested in pursuing maritime careers often go to other countries to obtain their qualifications. As a one of the main players in this industry, we are faced with challenges of a shortage of qualified and competent skills in this area,” he said. “We applaud UNAM supported by the Sam Nujoma Foundation for the noble initiative to establish this much-needed institution, which we believe will grow the Namibian maritime talent pool. This will allow Namibia to compete on a global scale with other countries,” he said challenging the university to remain dedicated and focused on this dream by developing curriculum and a training facility of international standards and accreditation “which we can be proud of and which the private sector can rely on,” he concluded. Caption: From the left, UNAM Pro-Vice Chancellor, Prof. Frednard Gideon, Coordinating Director of the Centre for Mining Research and Training, Prof Osmund Mwandemele, the Director of the UNAM Foundation, Lorna Mbwale and the Chief Executive of Debmarine Namibia, Otto Shikongo.